We at Insta-Pro periodically provide you with tips for a better understanding of how to evaluate ingredients and diets. The whole idea here is to provide you with clues for how well an ingredient or diet will affect performance – often, this information will not be represented in a typical diet formulation program. As I’ve said before, and will almost certainly say again, least-cost formulation programs are designed to do one thing – figure the least cost. This time, we’re going to discuss dry extruded corn. As with every ingredient, how the process is run will determine feeding value. We’ve documented this over and over with our high shear, dry extruded soy ingredients that have been used around the world for decades. Often when dry extruding corn, water is added to the extruder barrel to control the process. The amount of water use has a big impact on bulk density after extrusion (before grinding), enzyme susceptibility, and starch gelatinization, according to a published study. 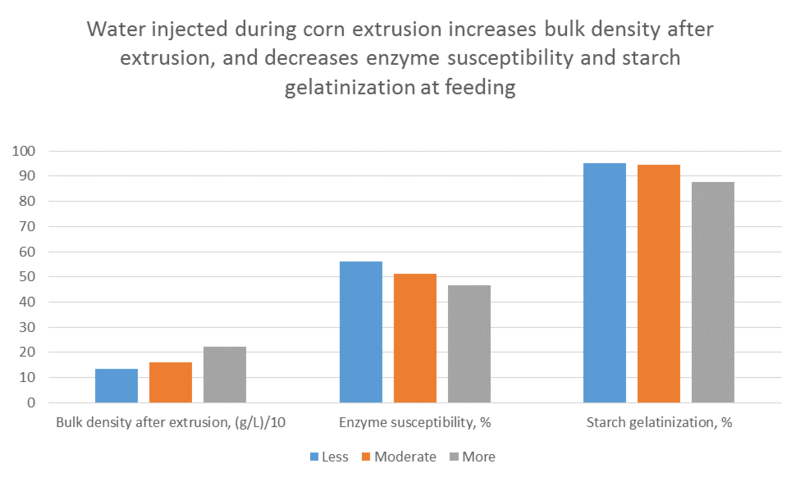 So, the use of more water during corn extrusion increases density, and reduces susceptibility to enzymes (by about 9.5% units) and gelatinization of starch (by about 7.5% units). When enzymes have less access to an ingredient in the digestive tract, fewer of the nutrients will be digested and available for use by the animal. Also, when gelatinization is reduced, digestion of starch in the intestine will decline. Overall, more water with corn extrusion results in an ingredient with lower feeding value. Luckily, the Insta-Pro version of dry extrusion for corn limits the amount of water, especially after the initial flow through the extruder barrel is established. Therefore, a higher quality extruded corn will result with our process. From this report, it appears that bulk density can be an important quality control test with dry extruded corn – as long as the sample is taken after extrusion (in this case, it was allowed to air dry and cool). Bulk density is very easy to measure (general idea shown here).